There is nothing better than spending an afternoon with good friends! It's especially nice when those good friends have kids the same age as yours who are also good friends! It's good times all around. 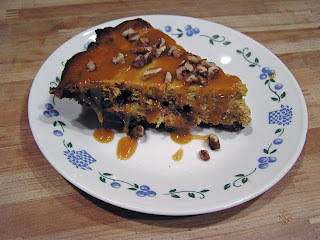 Add a pumpkin cheesecake drizzled in caramel and topped with pecans, and what could be better? Not much! This is the third of three pumpkin pies that I will be blogging about during the month of November. Take a look at the first two here and here and decide which one you want to bring for Thanksgiving dinner this year. They are all amazing! 1. Make your Graham Goodness pie crust. Set aside. 2. Combine pumpkin, pumpkin pie spice, and flour. Set aside. 3. Combine cream cheese, brown sugar, and white sugar. Mix until well combined. Add the eggs one at a time and mix completely. 4. Add pumpkin mixture to the cream cheese mixture. Combine well. 5. Pour about half the mixture into your waiting pie crust. 6. Sprinkle with your chopped chocolate. 7. Top with the remaining pumpkin mixture. 8. Bake at 375 degrees for 45-50 minutes or until a fork poked into the center comes out clean. 9. Cool and refrigerate at least 6 hours of overnight before serving. Serve drizzled in caramel and topped with pecan pieces. This pie was amazing! The pumpkin flavored cheesecake had a really good cheesecake consistency, with a strong hint of pumpkin. The caramel drizzle and pecan pieces really add to the taste as well as to the presentation, so don't leave them out! This is the pie I am bringing for my family's Thanksgiving. Hopefully my relatives will enjoy it as much as we all did! !